Scroll to browse or click on an image or text link to shop by gift-type. Or jump to Gift Cards. Wood looks great in kitchens. It exudes warmth and brings a touch of nature into the home. There’s no better housewarming or hostess gift than a lovely piece of wood that has been crafted into a highly functional device, such as a knife block or a cutting board. Stainless steel looks quuite nice in kitchens too. Especially when it’s forged into a stylish kitchen knife that fits so comfortably in your hand you might not want to ever let go. Artelegno is an Italian design studio whose artisans have been hand-crafting amazing knife blocks for over half a century. Their handsome blocks run the gamut – from simple, classic wood blocks with slots for knives to exceedingly elaborate designs. Their leaning knife towers include 3, 4 and 5-panel options. If you’re looking for an incredibly distinctive gift, consider their Pisa Abstract Square, Stair Steps or Paddle Wheel knife-holding blocks. These gorgeous knives – designed by F.A. Porsche – feature ergonomic styling and type 301 stainless steel, which delivers remarkably sharp edges that retain their sharpness longer. You can buy a single kitchen knife for paring, boning or filleting for instance, or a set of 2 or 4 knives. Or splurge on a 5, 8 or 10-piece set of knives that comes with its own sleek Chroma knife block. 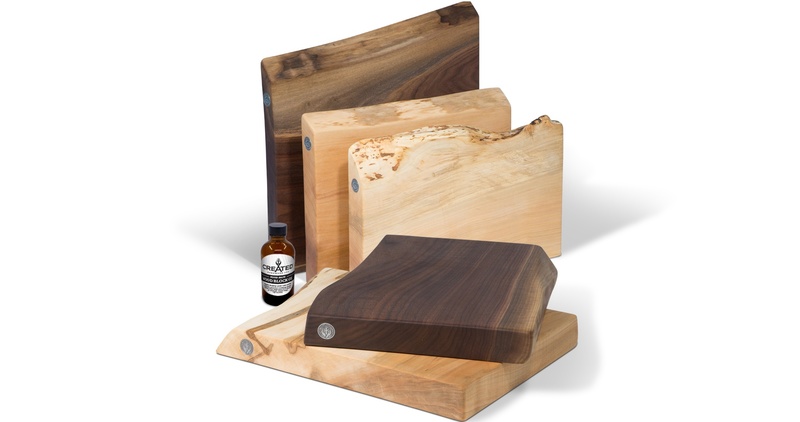 John Boos products are universally recognized as premium; you simply can’t miss by gifting a Boos cutting board. Their end-grain boards and chopping blocks are truly distinctive, along with their boards equipped with stainless steel handles, bands or bun feet. Italy's Artelegno also makes some striking cutting boards. Their remarkable collection includes the Torino, with a magnetic slot to hold knives; their Slide-Out, with a small sliding board tucked inside a medium-sized board; Siena grooved bread boards; and Parma boards with magnetic strips to hold cheese forks and knives. We all want to find for newlyweds a memorable gift - ideally a gift that's one of a kind. Created Hardwood's live-edge cutting boards fit the bill. Each handcrafted board is unique and brings into the kitchen a small glimpse of nature's beauty. Teak Haus specializes in teak, as you might have guessed. They offer a variety of gorgeous end-grain teak boards that are as durable (moisture and warp-resistant) as they are visually striking.